It's worth installing the fonthack before doing anything that installs a TIFF hack wallpaper. Then you can easily unbrick by removing your memory stick - I've had problems with tiff hack wallpapers failing to load, and without fonthack (or UP) then you can have an unrecoverable brick. 0okm. It will allow an unbrick if it reads the font from the memory stick. If that data is corrupted, or the meory stick is removed, then you will get a blue screen that tells you to restore default settings. It will not load the wallpaper allowing you to recover from a semi-brick. Don't use on other ver !!! 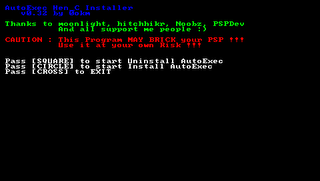 CAUTION : This Program MAY BRICK your PSP !!! Use it at your own Risk !!! BackUP all other File, when you uninstall you need to restore them !! great work as always 0okm!! I have a problem I did everthing it said and now when i turn on my psp it loads then freezes at the Screen with the time and date and battery is there anything i can do to fix this???? what psp ver you use ? did you modify anything ? did you follow the instruction step by step ? if your psp is fw2.71, did it installed the "Homebrew enabler for 2.71 (Revision C)" ? did your PSP FW2.71 had any Hack ? 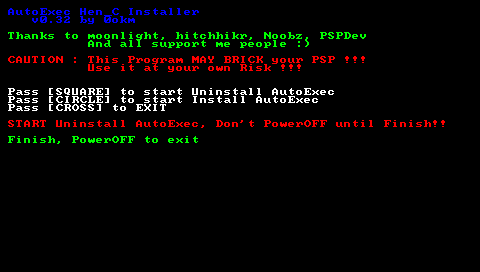 did you installed "Hen C" before install "AutoExec" ? did you change you MemoryStick ? did "Hen C" file in your MemoryStick ? what hardware ver of your PSP ? where " A lot of people are having the same problem" ?? i relly love your work, thats the bad thing bout me meesing up my psp with the autoexec. lol im also the one to blame i would guess. im not relly positive but it is freezing about the time the wallpaper loads. i dont know if i used a bad wallpaper or what. well this is what i done. 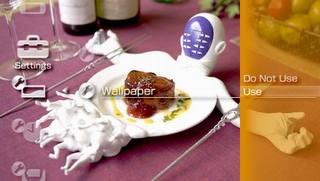 i went to themes and tryed to set Wallpaper use. it sayed go to photo and set a image to wallpaper from the photo viewer so i used one of my own images. was i suppost to use your image. can you give more information ?? what mean use gif as wallpaper ? use other method to make it ? then set it as wallpaper. sorry for not giving psp info early. can you remember it corrupted after what you do ? Thank u soo much it worked it past the freeze screen and now i can mess with the main menu now im going to check if i can unistall it. i format MS and reinstall henc, but i get the same error hen i try start it. I can make a video and put in youtube to you see what is going on? thank you sou much my idol. working like a charm now. If you are planning install "no red patch" do it before install autoexec, cause if you disable wallpaper, you will need uninstall and reinstall autoexec to it backs to work. And remember, you need to set wallpaper on and restart before install autoexec... put any .jpg .gif file in PHOTOS folder, get in PHOTOS menu and set it as wallpaper. Now you can go on. 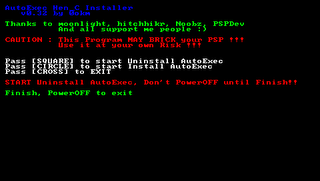 I Have problem after I install AutoExec and NoRed too Finish. it work perfectly but I miss to delete AutoExac without exit the problem then make my PSP stop didn't load HENC anymore alway freeze at blue screen and then turnoff didn't reboot ....... can you help me fix this? I'm need big help. 0okm, when i select 2.71 (flash) in FIRMWARE menu at DEVHOOK 0.4x for 2.71 and after select START, the autoexec try to load HENC again, making PSP freeze at blue screen and a few secs later turn off. You can fix it, or we can only use emulated firmware using AutoExec? btw, if you back to the scene, why not going on with ta-082 donwgrade? Thanks for suport. I was just wondering if maybe you saw what I did and came up with a better way to run it. Alright i found out the problem when everybodys PSP freezes. In your psp MS before u do this mod and when done keep this stuff in ur MS for it to boot the way its suppost to everytime. K now how do u change the wall paper on that mod? I alway get Open file Error, PoerOFF to Exit.....whatever I use HENC-HENB-HENA-AutoEaxc-NoRed ...... can't install anything so sad need help! My Board TA-082 FW2.71 ?????? 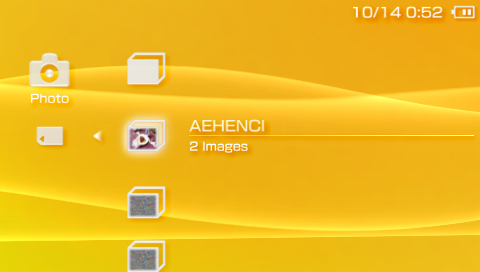 1. use "disable PSP Wallpaper" to stop "AutoExec Hen C"
I like to say this is great software, even tho I had some freeze issues, and your wallpaper remover solved my issue. My question for you 0okm since you understand TA-082 Hardware better than most. Is it possible to use the Generic downgrader from 2.71 to go down to 2.5 without any bricks, since in my believe there could be the possibility of 2.71SE working on this mobo, that way ppl can downgrade to 2.5 and with some exploit install 2.71SE, since this mobo is not suppost to support any other firmware lower than 2.5(i think)? this is NOT a downgrader !! i didn't try "Generic downgrader"
...glad to help out a little. I understand that 2.71 is better than 2.5, but what I mean, is that if they release 2.71SE for TA-082 mobo, and you need to be in either 2.5 or 2.6, would it be necessary to downgrade, or there could be the possibility of using the same 2.71 Henc and a pbp that hacks into kernel and installs this SE FW? "Ta-082 users can downgrade to 2.70/2.60/2.50. TA-082 users, DO NOT downgrade below 2.50"
"TA-082 users cannot use this because a 1.50 bootstrap is needed to boot the system patched. At the moment, there is only installer for 1.50, although it could be easily ported to whatever firmware with kernel access such as 2.60 and 2.71, but at the moment i prefer not to doing it to avoid TA-082 using it and bricking their psp's"
Hope that clears up your questions. I'm sorry that the answer is not what you are hoping for. hey, thx for the answers nk64, i have read this before, but what I didn´t read was the part of the 1.5 bootstrap, so it´s like it´s running 1.5f with 2.71 goodies so to speak adding the 2.71 kernel. At 0okm, thx for gread software, support at this blogpost, and I´m not going to order your or push you to do something, but You think you can push this limit that I mentioned about the 2.71 enabling the 1.5 kernel to be accessable via some fw exploit??? thank you for your awsome work. but i TA-082 2.71 psp. i had install your Hen C AutoExec mod v0.32 and when i went to execute it, i then found out my psp is low batt. it execute halfway thru and my psp turn off due to low batt. when i charge my psp and turn it on, it freeze my menu. i can load UMD games. but i can't go to my main menu. by the way, i had read about the wallpaper remover. but i can't get it as my computer is protected against the website. can u upload it into a direct link (not thru uploading engine) in zip file?? after using your wallpaper remover , i can't use your autoexec hen_c. help !! i personally had a issue where my psp would boot henc than freeze but umds ran it was strange. the autoexec mod will boot any tiff hack bin named h.bin i hope this is helpful to others as it was to me! Instale siguiendo la guia y ahora al momento de encender el psp se traba(freeze) en el menu de la psp, AYUDA!!!!!! ookm thank you for the ta-082 homebrew help. is there going to be an auto exec for hen d? or an launcher for devhook .50 for 2.71 psp?